Northbound Stoney Trail at Country Hills Boulevard N.E. was closed Friday morning after a cattle truck overturned. It has since reopened. Northbound Stoney Trail at Country Hills Boulevard N.E. was closed Friday morning after a cattle truck overturned but has since reopened. ROAD CLOSURE<br><br>Be advised due to a tractor trailer rollover, NB Stoney Trail NE at Country Hills Blvd NE is closed. Traffic will need to reroute to Country Hills Blvd NE until scene is cleared. 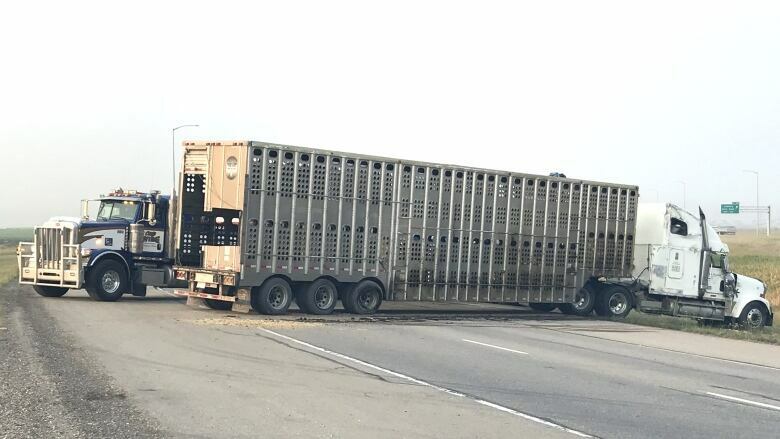 The 15 cattle in the trailer at the time of the rollover were not injured and neither was the driver, according to police. Police said the road was clear shortly at 9 a.m.